Bitcoin faucets are constantly evolving. They keep looking for new ways to make profit and some of them have changed their approach towards making serious Bitcoin mining investments or using gambling to further supplement income. This evolution now led to a really interesting new option that you may want to take advantage of. The idea is that it is better for the sites for the user to keep the balance instead of withdrawing it. Most people that get money from Bitcoin faucets will make withdrawals as soon as the minimum is reached. This brings in taxes and more time having to be dedicated towards managing the site. 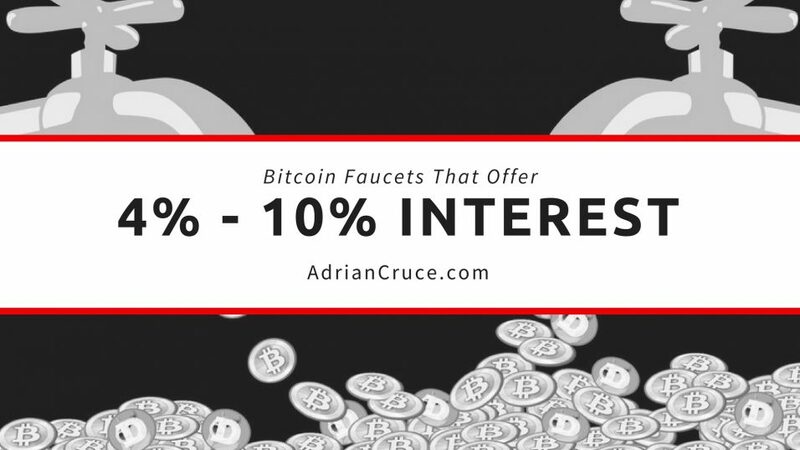 As a response, we have 2 large Bitcoin faucets that now offer interest when people decide to keep their balance and withdraw later. We thus have the following options you absolutely want to take into account. Further Reading: How Can You make More Money From Bitcoin Faucets? Freebitco.in was the very first faucet that started to offer an interest. The offer they have is 4.08% yearly interest offered on a compound basis. Interest is added to the balance every single day if there is a minimum of 30.000 satoshi in the account. Swiss Ads Pays is the best playing hourly Bitcoin faucet you can make claims from at the moment. They quickly realized how beneficial the Freebitco.in move was and they implemented something really similar. They now offer 4% annual interest compounded daily rate when the balance is at least 50.000 satoshi. The gold members actually get 10% with a minimum of 30.000 satoshi. Multicoin Faucet is owned by the same people that operate Swiss Ads Pays so it should be no surprise to see the same exact deal being offered. Although the site pays less than Swiss Ads in terms of faucet claims, it is still some extra interest to think about. Should You Take Advantage Of The Faucet Interest Option? The yearly rate is not that much. However, a key thing in making money online is diversifying your investments and taking advantage of different opportunities in order to have a higher stability. At the same time, keeping Bitcoin in your wallet and not using it for anything is something that does not help you. Through the interest offered by these faucets you can at least make something. I should also mention that the decision will be based on your risk tolerance. If you are not afraid of risks, you can always go for the revshare investment option. If you just want a stable, low income that compounds and makes use of your funds without being exposed to much risk, adding some Bitcoin to the faucets is a great idea. Since the faucets pay based on their income, the possibility to lose money is really, really low. I am a huge advocate of diversification so I had to pick up on this new opportunity. I currently use 50% of my available Bitcoin in revshare investments. I keep 30% for new investment options that may appear (you always have to try to be among the first to maximize results) and the rest of 20% will be kept in these 3 faucets for some extra free income. You can do the same or something else. I even know some that put in all the idle Bitcoin funds they have into these faucets to keep balances growing. I do not recommend this though. It is always better to be safe. However, investing part of your available idle Bitcoin in these sites is a pretty good idea.